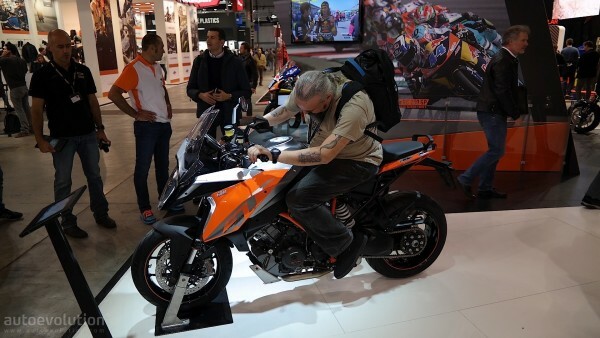 The EICMA 2015 like every year has seen some of very good launches for the upcoming year. Every motorcycle company is here with something new. KTM one of them is here with a long line-up and most of them are manufactured in India at the manufacturing facility of their 47% stake holder Bajaj. 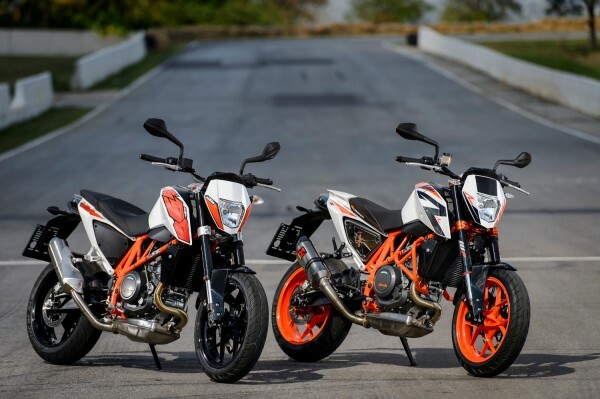 KTM’s line-up include the naked street Duke range and the faired RC range based on their Duke siblings. Let us have a detailed view. The KTM duke is the company’s street range that provide a very nasty ride. The middle range 690 cc KTM Duke is not so famous in India but have vast following in other parts of the world. KTM has unveiled a new 2016 Duke 690 and 690R at the EICMA 2015. Both the variants receive an upgrade for their engine with a new intake camshaft for a smoother ride than that of the previous versions. The new Euro 4 norms have resulted in new intake and exhaust systems. The engine revisions have also resulted in an increased rev range by 1,000 RPM for a more linear torque curve. However, the displacement figures remain the same. The 690R gets an Akrapovic exhaust that has increased the power from 73 HP to 75 HP. The 690R also gets cornering ABS, lean angle sensitive traction control, KTM’s Motorcycle Stability Control (MSC) and KTM’s Motor Slip Regulation System with Supermoto mode. The bike comes with three riding modes – Sport, Street and Rain. It also gets adjustable suspension preload. The 690 customers can add a “Track Pack” to equip the bike with KTM’s Motor Slip Regulation System, riding modes and traction control. The bikes can differentiated by the graphics. Hope we get the 690 soon in India. 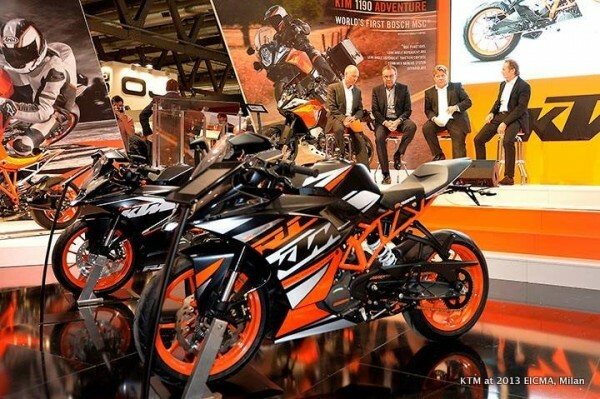 KTM has launched an adventure sportbike based on the KTM 1290 Super Duke R, the 1290 Super Duke GT. The bike will directly get the engine from the sibling but is tweaked to get appropriate performance. The figures though remain identical but are attained at low RPM, the 172 HP is now attained at 9,500 RPM and the 106 lb-ft of torque at 6,750 RPM. The bike looks similar to the sibling it is inspired by but with changed ergonomics and aesthetics. The Super Duke GT has a lower ROM level which will be loved by the riders who like to feel the engine’s power right from the idle position. The new bike gets a special ABS with supermoto mode which will allow the riders to take the bike out for tracking without the fear that interference from ABS will ruin their experience. The bike will be praised across the world but no reports for Indian debut are available. Now this is what really matters to us, the Indians. KTM has unveiled the 2016 RC range which include the 125, 200 and 390 based on their Duke siblings. The new bikes have the same frame, brakes and most of the parts but KTM has mainly worked out performance. The bikes have received new riding features, aerodynamic fairing, better center of gravity, etc. for enhanced riding. The new bikes will feature the same engines as their Duke counterparts like the 390 generating 43 BHP, 200 good for 25 BHP and the 125 pumping out 15 BHP. KTM also claims that the top speed has also increased by 10 km/hr across the range. The RC 390 will come with a new aluminium exhaust that puts behind the underbelly exhaust from the previous model. The bike now comes with a slippery clutch which willhelp the rider to downshift quickly. It will also have a switchable ABS. The braking department will be handled by 300 mm disc at front and 230 mm disc at the rear. The prices are expected to remain near the existing prices. The bikes are expected to make its Indian debut early next year.